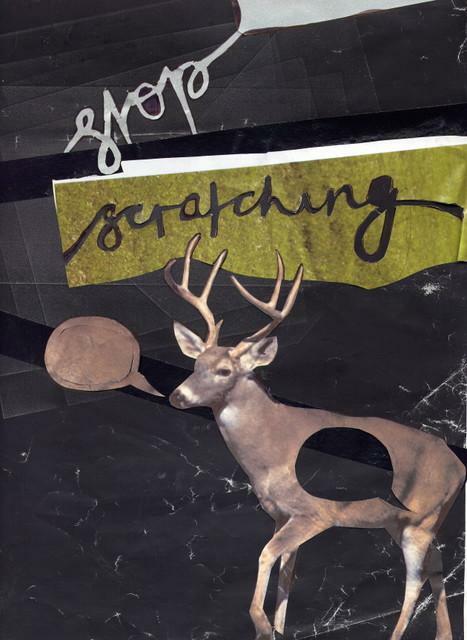 stop scratching: a deer is for life, not just for christmas. I was tidying up my desktop and organising things into folders yesterday (sad i know, it's a habit that Cassie got me in to) when I stumbled upon a folder of pictures from ATP vs Pitchfork back in may which I had completely forgotten about. When thinking back to that night, it's hard to imagine i'd easily forgot the ordeal I went through in order to get them. It was the Sunday night of ATP and we'd consumed way to much of whatever we could over the course of weekend so we were bouncing about Camber Sands like kids full of sugar on the night before Christmas. Needless to say, after a weekend of such epic proportions our attention spans had dwindled into something equally as juvenile. 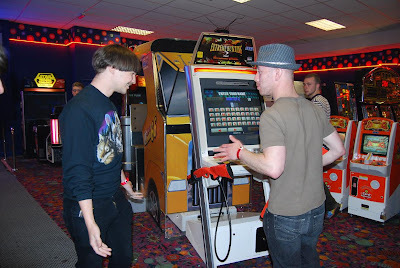 Not content with the Sunday night offering of bands and all smoked out, we had no reason to be outside in the chilling night air so we decided to go and make use of what the arcade had to offer. All was going well at first, we played some games, playfully harassed some elders, won loads of prize tickets and were generally making the most of the last night at my favourite place on earth. Then...we saw it. 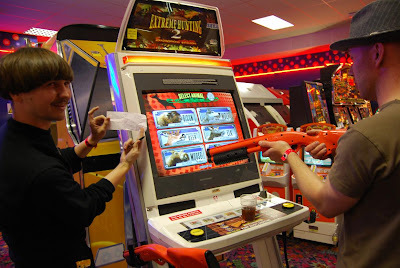 "It" was Extreme Hunting 2 a 1st person shoot 'em up but this wasn't your standard, post-apocalyptic zombie type affair, this was "hunting", or aimlessly shooting poor innocent animals for £2 a go. One of these sets of animals being DEERS, yes DEERS. For those of you who don't pay attention, the comics that come with each and every stop scratching tape detail the adventures of a cat, who represents myself, and a deer, who represents Cassie. So you can imagine my outrage. It was probably about 1am, Sunday night, but I had to phone Cassie and express my outrage. Much outrage later, I let her go back to sleep but I couldn't let Sega get away with this travesty so I set about the Lord of the Rings sized task of warning everyone off playing the game. 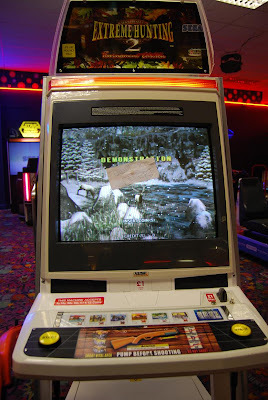 Now, at this point in time to quote Alexander Shulgin's system, I was definitely not at baseline, so standing next to a video game shouting about how my girlfriend is a deer and not to kill them to anyone who walked by quickly wore thin, not to mention getting me a fair few odd looks. A NOTE. I hate to find some paper and leave a note to warn people off playing it, something simple and to the point. 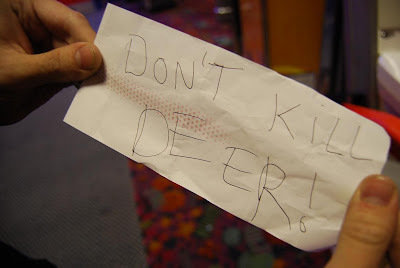 DON'T KILL DEERS. That should do it. 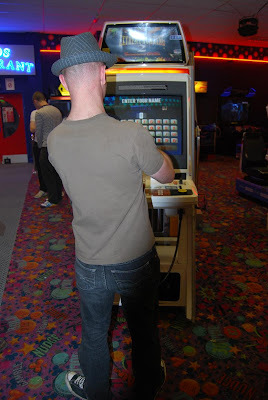 Now, finding a pen and paper at 1.30am on Sunday night standing in an arcade in the middle of a festival at Butlins. Easier said than done, believe me. After some more harassing of passers by for a pen or some paper I noticed across the way a small kiosk was open, selling drinks, crisps and other such holy grails of late-night-munchie-seeking-festival-goers. After a lot of difficult searching I discovered that they didn't sell paper, but they did sell pens! One step closer. After about 10 minutes of trying to frantically explain the whole thing to the cashier, I convinced him to donate some till roll to the cause. So, with the note wrote we headed back over the horrible game but quickly realised the paper was not going to sit on the slippery, slanted surface of the screen. So I went back to the shop in search of sellotape or any kind of adhesive, they didn't have any. I stood there for a while. Refusing to be defeated I went back over and tried and failed again to stick the paper to it. CHEWING GUM IS STICKY. It hit me. Everyone has chewing game. Again some more harassing of the general public ensued. No-one had chewing gum!? Back the shop! 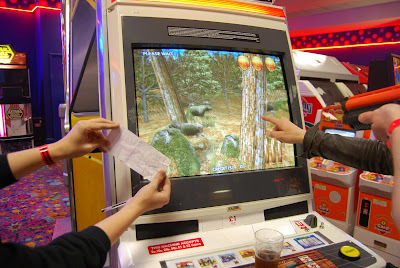 He had chewing gum, so I bought some popped one in my mouth and made my way across the arcade to finally put Extreme Hunting 2 out of action. When we got there, much to my surprise and dismay, a young man with a hat on was standing there, gun in held proudly in hand, choosing his poor defenceless victims. I ran over panicking, what if he'd chosen Deers already!? Ohmy. He hadn't. 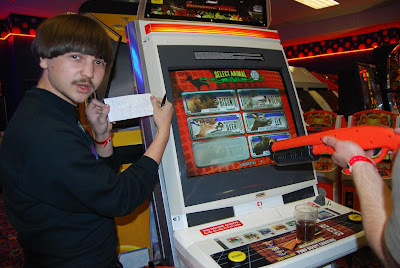 He had however, just paid his £2 and as much as I flapped about, I couldn't convince him to not play, he was a nice, accomodationg chap though and after I explained my ordeal he agreed to shoot mooses instead. Me and Louise did a good job of sabotaging him and because of our interfering he only managed about 3 shots on the whole level and thus failed to get to the next round (if you're reading, man in hat, sorry but it had to be done). He finished playing by which time the chewing gum was soft and good to go, so after apologising to the poor fellow, we stuck the sign to the front and danced around with a warm sense of achievement and an ever warmer sense of accomplishment. It was hard work, and all together took about an hour but we saved a lot of deers lives that night so it was all worth it in the end.